Mummified mice are among the artefacts discovered in a decorated tomb recently unearthed near the Egyptian town of Sohag. The mice and other animals surrounded two mummified human bodies and the burial chamber contains detailed paintings of funeral processions and people working in the fields. 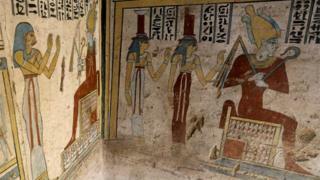 Experts say the tomb is more than 2,000 years old and is thought to be the resting place of a senior official called Tutu and his wife. It was discovered in October when smugglers were caught illegally digging for artefacts. The Egyptian government's antiquities ministry hopes the finds will draw visitors to the desert town 390km (242 miles) south of Cairo, near the Nile. 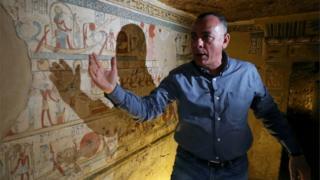 Mostafa Waziri, the secretary general of Egypt's supreme council of antiquities, said it was a "beautiful, colourful tomb" and "one of the most exciting discoveries ever in the area". Since the 2011 uprising, the country's political instability and insecurity has hit the tourism industry. The ministry hopes this new attraction will help draw visitors back. 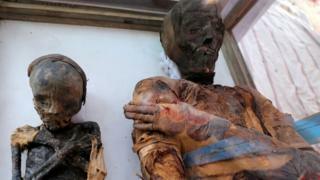 A mummified woman and boy dating back to the Ptolemaic era were put on display outside the tomb. The woman is thought to have been aged between 35 and 50 when she died while the boy was 12 to 14. 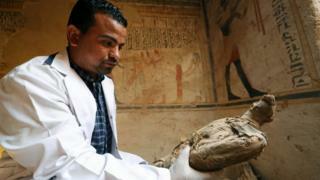 More than 50 mummified mice, cats and birds were also unearthed. Here, an archaeologist examines a carefully wrapped falcon. 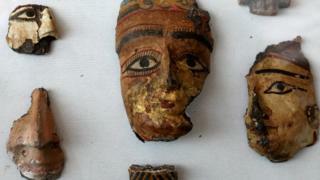 Among the treasures found inside the tomb were fragments of painted, decorative faces. 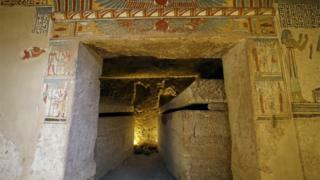 The antiquities ministry said the presentation of this newly uncovered tomb was intended to "draw the world's attention to the civilisation and antiquities of Egypt".